The adoption of nuclear power revolutionized submarine design and means that vessels can stay underwater for months, trailing the enemy or training weapons on land targets from secret positions, "always there, never seen.” Jim Christley, a former submariner, explores here the influence of Admiral Hyman Rickover in cautiously introducing these stealthy machines of war, and frankly discusses the power and perils of using nuclear reactors at sea. Using unique and detailed artwork, he outlines the many evolving aspects of design within the submarine classes, from the very first nuclear submarine, USS Nautilus, to the classes under construction even now. Jim Christley retired from the US Navy in 1982 as a senior chief petty officer having served on seven submarines ranging from diesel to nuclear fast attacks to ballistic missile boats. 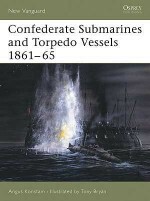 A student of US submarine technical history, he has written numerous articles and a book on the subject in addition to providing technical illustrations to several notable books on submarine design and history. Jim is a resident of Lisbon, Connecticut. Tony Bryan is a freelance illustrator of many years' experience who lives and works in Dorset. He initially qualified in Engineering and worked for a number of years in Military Research and Development, and has a keen interest in military hardware - armour, small arms, aircraft and ships. Tony has produced many illustrations for partworks, magazines and books, including a number of titles in the New Vanguard series.